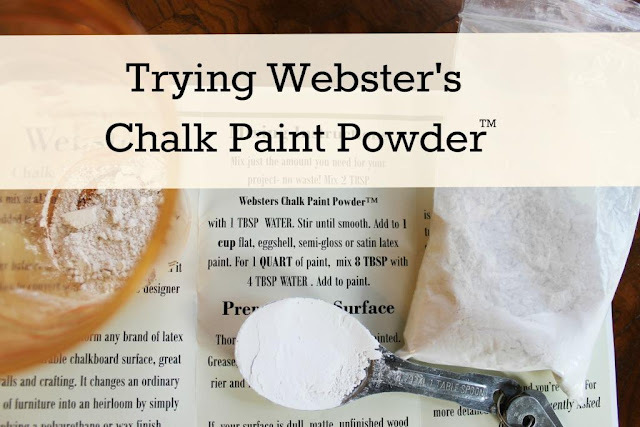 Have you heard of Webster's Chalk Paint Powder? to home made chalk recipes". expensive than some of the other chalk paints on the market. batches of chalk paint in whatever color of paint you need. eggshell finishes but not high gloss. is an end table in the living room. My husband has had it for about 35 years. area well. He says that he "paid good money for it"
and has been reluctant to let it go. powder on because it doesn't have a large surface area. of paint and see how far it would go on the piece. burled wood on top alone. It is pretty wood on top and has been very durable. In its 35 years it only has a tiny boo-boo in the surface. handy-dandy formica-topped beverage pull out shelf. of chalk paint that you want to end up with in the end. I thought that it would take two cups of paint to cover the table. sample paints that are 8 oz. ($3 each) from Lowe's. of where one cup would come up to. Sure enough, the contents of the sample jar of paint was one cup. You add the powder and water mixture to the paint and stir. coats of chalk paint if you want the piece completely covered. started in the solo cup and the level after the first coat? I decided not to mix up a batch of the second color. lighter than I thought it would. by turning it at different angles to get all the surfaces. The second coat of paint used even less paint than the first one. After the second coat, I poured the left over "now chalk paint"
and to re-stir the paint before using it again. distress chalk paint pieces so I purchased some . elbow grease to get a distressed look with the 200 grit. I wanted even though I tried to not sand too hard. Maybe 150 grit would be a happy medium for me. over some of the places where too much paint came off. waxing if the chalk paint is on furniture to seal the paint. of AS "Old White" and "Old Ochre" chalk paint a while back. Minwax Finishing wax in the clear color to use with the dark wax. a coat of clear wax all over the piece. This intensifies the color of the chalk paint and helps to seal it. you add it on top of the clear coat of wax. wax to rub some of it off if it is darker than you want. The dark wax can be shockingly dark by itself. before putting it on a piece to "dilute" it some. Just cream it together with a fork like mixing in butter. where she uses paste wax on chalk pieces frequently. with a clean white cloth. drops of water next time I mix some up to thin it a little. But, I still don't love this table. it surroundings better and be less noticeable. to be my favorite part on the painted piece. quart and then about $5 shipping). Cost-wise, not a big difference in price. to mix the powder with and have a 8 oz. of each color. quite a bit larger piece than I used for this project. and don't breathe in excess sanding dust from wall texture). natural" and safer than cheaper home made chalk recipes. cups of chalk paint for future projects...I like them all. Great post! Very useful and your instructions and process are so clear. I'm glad you didn't mess with the burl on top, that is a gorgious top, the overall effect makes it stand out more. I think your table turned out beautiful and your bookcase on the left seems to highlight it even more. I've been thinking about painting an old dresser in chalk paint and I'm leaning towards Annie Sloan's. Although it still seems too expensive to me. I don't like mixing stuff on my own. I can never duplicate the results if I need more. Still haven't gotten my nerve up to do this project, but every time I read about someone else doing it, I get excited all over again! I'm confused at how adding anything to LATEX makes a healthy more natural alternative ? Isn't it still latex paint? I do paint a lot for my business...so it looks like I need to try this stuff. Thank you for sharing your little table at my NIFTY THRIFTY TUESDAY PARTY. Thanks so much for sharing your experience. I have used AS chalk paint on several occasions but have not tried the powder. Good to know how they both perform and compare. Oh, and I like your little table. I love the pull out tray and I think it looks lovely painted. Sometimes we just get it in our head that we are sick of something and can't see it in any other light. I just dropped off a wing back chair at Goodwill that I was sick to death of so I understand but it is a pretty table. Visiting from Nifty Thrifty Tues. Have a great week. I hadn't heard of chalk paint powder, so I'm glad to have found your post. I've used plaster of paris and unsanded grout to make my own chalk paint, and of course, I've used the real thing and milk paint. From your post, I'm not sure that there's much of a cost benefit to using the powder versus buying Annie Sloan. That is, unless you can find the powder locally. Have you tried unsanded grout added to regular paint? 1 tbs of powder to one cup paint. I bought a small tub of the grout for a$5 and it'll probably last forever, worked great too. I used it on to redo my kitchen cabinets. The table turned out beautiful...I am so glad that you kept the burled wood top as it is gorgeous...thanks for presenting this option of chalk paint...I have just used ASCP with great results. Years and years ago, I bought cabinet and they used the powdered chalk paint as it was the only way it came..
Hi Gayle, I just saw this powder being sold at the Fancy Flea and it is great to hear your review. I was wondering if the ingredients are listed. Thanks for linking to the Open House party. Now that turned out gorgeous! I never heard of that stuff, but will certainly have to try it sometime!~ What a great looking piece. Thanks for all the useful info...I can't believe that they have the nerve to charge $13.95 plus $4.00 shipping for essentially a $1 worth(maybe) of product. If this was to be a cost effective alternative to ASP, it failed. I will stick with ASP! Hi - Thanks for your review. I've been using non-sanded grout and making my own chalk paint for quite a while. The mixing insructions are exactly identical to that for the non-sanded grout and therefore makes me wonder if they are packaging the identical product. Are the ingredients listed. I purchased a 10 lb. box of non-sanded grout for about $12.00 at a local home improvement store. Just wondering. You did such a great job of showing how things worked, comparing mixing it, the effectiveness and the cost, excellent tutorial much appreciated. I have a question that I need an answer to: I bought a 4.85 lb box of unsanded grout for $1 at the thrift store, does the unsanded grout go bad or lose it's effectiveness after a time? I have no idea how long it had been open but thought I didn't have much to lose by trying it. I got some sample jars of the Valspar reject paints at Lowe's to try for $1.00 so that was a good deal also. Was lucky to find colors I liked. Guess I answered my own ?if it came out ok huh? duh. I'll just keep using it til I feel like it's not working right. I had to keep the cost down so thought trying this would be worth it and it has been. When I have a project now I go to the reject paint spot at Lowe's. I've gotten some nice spray paint in their brand also. I love furniture that has a painted base and a wood top! You did such a fabulous job and it definitely looks better than before. Thanks for the tips! I've been trying chalk paint made from latex and baking soda, it works really well!! Awesome post! Thanx for the very clear info and the pics. I love, love, LOVE the Valspar and other small trial containers of paint! They've kept me from having so many cans of paint colors I may never use again! I wonder if the Webster's Chalk Powder is Calcium Carbonate. I love and use ASCP but I did once (sucessfully) make my own chalk paint using powdered Calcium Carbonate which I purchased at a health food store in the vitamin dept. I have read that it can be purchased pretty inexpensively in larger quantities from big box stores but haven't really tried to find it beyond looking at my local Home Depot. It might be more easily found online (perhaps Amazon). You could probably save some more bucks by looking into that. I love how your table turned out - it does make it blend into the room better now. And I love the burled top, so I'm glad you left it. Since I only just tried my very first chalk paint this week, I was glad to find your post about it - it feels like I'm finally know what everyone has been talking about. I'm going to work on my aging technique, so I'm glad you mentioned with grit of sandpaper you used. Perfect timing! Oh, how pretty your table is! I love that you left that pretty burled wooden top too. I have to confess, I've never used chalk paint. I hear folks say it's so easy! Thank you for showing us just how to use it. I also wanted to thank you for popping in to Cindy's blog and touring my home. I was so honored Cindy asked me. I think the table turned out great. I love natural tops with painted bases. You did a great job and thanks for telling us about this new product. Thank you very much for blogging about our product. We will be happy to answer any questions or concerns any of your followers may have. Please contact us anytime at info@websterschalkpaintpowder.com One follower commented that latex paint itself is not healthy because it still has latex in it. This statement is incorrect. Latex paint has become a generic term and there is no longer latex in paint. Most are 100% acrylic based. Anything else we can clear up for you? We'd be more than happy to. Hi. I love your site and check it regularly but had to update you on something. I am the creator of Garrett's Chalk Paint Mix and it is made and sold in Concord, NC. It covers better than Webster's, cleans up better, and we package more powder per pouch. We all ship for free and sale wholesale. I carry Briwax Wax to follow up the paint job. If you would have used our paint mix, and our selection of Briwax Light Brown Wax, I guarantee you would have been happier with the finish of your husband's table. Our mix is thicker, and the Briwax finish can't be beat. Contact me if you need either or want to test it out. Our Garrett's Chalk Paint Mix is $16.25 per pouch of 10 tablespoons and the stay-fresh pouch keeps it dry long term. The Briwax is $17.50 per can and will last a long time. The tinted wax serves to make it look old. You wouldn't need to paint 2 colors. Just 2 coats of white and a little waxing. Done! Our website for Garrett's Chalk Paint Mix is garrettschalkpaintmix@carolina.rr.com. We also sell on ebay.